We believe in our children and children are at the heart of everything we do. This defines the learning that is important for our children and our school. We believe there should be a greater emphasis on teaching the basic skills of reading, phonics, writing and maths and our curriculum reflects this belief. We have developed Programmes of Study which contain essential learning for each year group. Objectives are repeated so learning is deep rooted in everything we do. These are combined with the objectives for our school curriculum where we recognise and value the individuality of each child. The curriculum will support vulnerable and disadvantaged groups of children as they progress through school. Foundation subjects are then taught creatively to link learning experiences for children; enriching and extending their learning. We aim to create and sustain an inclusive environment where children feel safe, secure and confident enabling them to develop enquiring minds, become good learners and build on their successes. The curriculum will help the children become active, engaged members of society who care about their role as part of a family, community and the wider world; encouraging the children to have a good understanding of British Values and citizenship. Children in Pre-school and Reception follow the Early Years Foundation Stage Curriculum. This learning challenges children and encourages them to develop into independent, motivated learners and thinkers, full of curiosity about the world around them within a fun, happy and secure environment. Children have opportunities to explore, enquire and to take risks through practical, hands-on learning experiences. At Stanbridge we have a high quality outside learning environment which the children are able to use throughout the day. We give pupils ‘first-hand experience of the diverse make-up of modern British society’ by teaching them respect for other faiths and developing their awareness and knowledge of communities different than their own. We value the diverse ethnic backgrounds of all our pupils and throughout the year we hold a variety of events to celebrate these. Music and singing are an important aspect of life at our school. A great variety of music is played and celebrated in school each day. Children sing across all areas of the curriculum, at every opportunity. In lessons the children are given every opportunity to develop their musical skills and talents. We actively teach music appreciation through discussion and through topics. Children have the opportunity to receive musical tuition and can learn to play the piano, recorder, violin or flute. We are a Sing Up school and the children are given many opportunities in Yr 3 and 4 to sing, whilst also having drumming or Ukulele lessons. We are very fortunate to have a large school field, a marked hard court, all weather area, as well as playground space, and all this space is used to encourage a positive attitude towards PE and sport. All children are taught skills and competencies in gym, dance and games. Coaches from different sports give children expert tuition across the year. Staff receive expert coaching from the School Sports Partnership and so do the children. Annually our older children take part in a residential field trip where children can participate in more adventurous activities such as rock climbing, boating, sailing, orienteering, archery and low/high ropes. Swimming takes place in the autumn term for children in Yr 3/4. Lunchtime clubs run across the year for all children to take part in. We believe the children should be educated to live in today’s society and they need to be able to make informed decisions on many issues, becoming citizens in their own right. We aim to teach them how to become socially aware about the needs of themselves and of others, be aware of personal safety, and to adopt healthy lifestyles. Sessions in PSHCE are presented at a level of understanding appropriate for the age of the children and circle times are used as discussion forums. This area links closely to RE and the teaching of British values. See above to view the PSHCE Curriculum Map. All other subjects are taught through topics. We believe this is the best way to inspire and motivate children to learn and for teachers to teach. We use this approach so that children can make connections in their learning and make the learning relevant for the children. This enriches and extends their learning. We call this their Creative Learning Journey. All the plans for this can be viewed in the parents section of this website. Please click on Termly Plans. Focused Art Days eg clay day, landscape drawing day, take one picture. A residential school journey to Grafham Water Centre for Yr 3 and 4 children where they take part in adventurous activities. 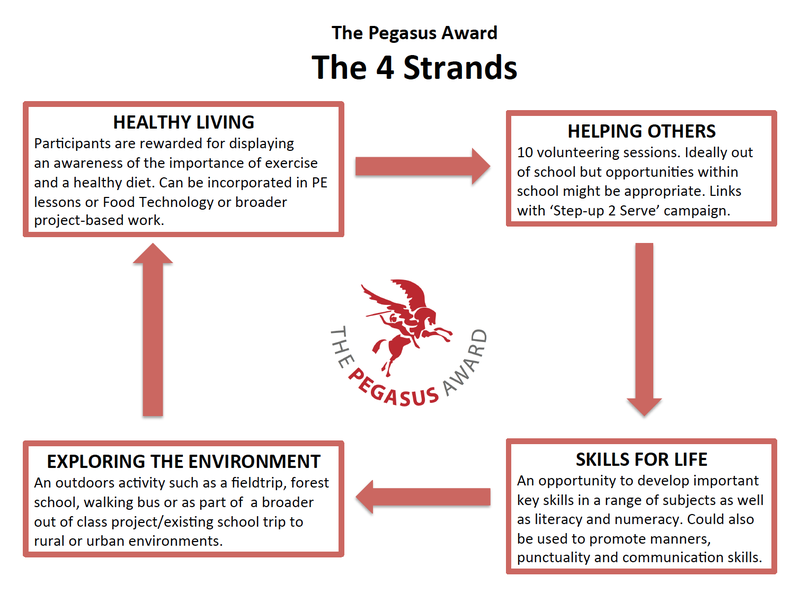 In 2018 we introduced the Pegasus Award for Year 3 and 4 children. Pegasus can remove barriers to learning and offer opportunities to people regardless of their age and ability. It provides a vehicle through which teachers, can reward effort and attainment in line with existing target-setting approaches. The children create their own targets to work towards and demonstrate their ability to persevere at a task, seeing it through to completion. This is a brilliant award for children to demonstrate their commitment towards learning, progressing and achieving and enables the children to become independent, good learners and build on their successes. Achievements and progress are tracked in all curriculum subjects. Termly tests and teacher assessments are used to assess progress in reading, writing, grammar, phonics and maths. This ensures the teachers know who is making good progress towards their targets and who needs some extra support. Progress and attainment in foundation subjects are also tracked using our assessment systems. Parent Consultations are held in the autumn and spring terms. In the summer term parents receive a full written report summarising their child’s achievements and progress across the year. An open afternoon is held in the summer term for parents to meet with their class teacher to discuss reports. Parents are able to come into school to look at their children’s work. This is a lovely occasion which we all look forward to. Curriculum Impact – What do we want for our children? At Stanbridge Lower School we have designed our curriculum for it to have the following impact on children…..
Children’s attendance at school will be the best it possibly can be. Children will reach their full potential gaining a firm understanding of reading, writing and maths, reaching their age related expectations across the curriculum and make the best possible progress. Children will gain skills and knowledge which helps them prepare for their future educational experiences. Children will engage with and enjoy their learning within a creative curriculum; taking part in lessons which are exciting and stimulating. Children will be good learners with enquiring minds who persevere. Children will become digitally aware, health aware and be able to realise the importance of looking after their emotional wellbeing to keep themselves safe and happy. Children will know how to be active, engaged members of society who care about their role as part of a family, community and the wider world; encouraging them to understand British Values and what it means to be a good citizen. They will know the difference between right and wrong, fair and unfair and know how to make the right choices. Children will feel safe, secure and confident in a sustained inclusive ethos where diversity and cultural identity are valued.